There are many things I love about summer including the long summer days, warm weather, sunshine and the new arrivals in the animal and bird worlds. 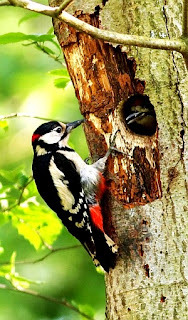 I enjoy watching the young animals and birds as they grow and learn behaviours from their parents to allow them to survive in the wild. 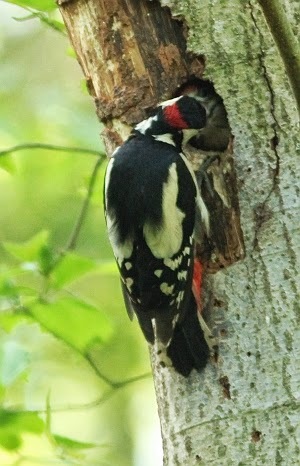 One of the interesting birds I have seen this year is a Great-spotted woodpecker which has built a nest in an old tree. 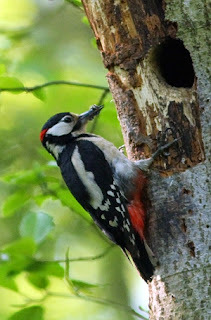 The nest is in a secluded wood near my home, well away from the footpaths in the area. 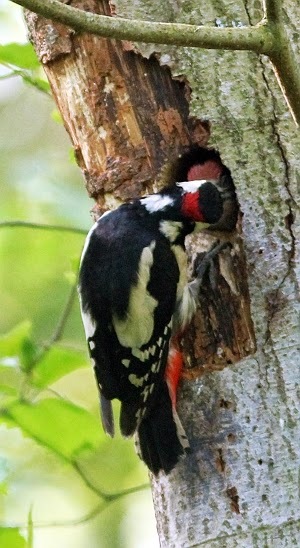 This has allowed the Woodpecker family to get on with their lives without too much disturbance. I have been going out at different times of the day to try and get some photographs of these birds, as it is quite unusual to find a nest so near a residential area. In fact, the whole area is rich in wildlife but not many people are aware of this. As a result, the wildlife is allowed to live undisturbed in the area. Below are some photographs I took. One the day I took the photographs I arrived in the woods just after 05.00 when the area was alive with birdsong and the grass was still covered in dew. The sun had risen at 04.15 and it was still a bit chilly. I had my vacuum flask with tea and some croissants, as I expected to be there for a few hours. I took along an SLR camera, a tripod and a small folding stool to enable me to get some images. When I arrived at the area near the nest, I set up the tripod and camera and adjusted the height of the tripod to suit the height of my stool. I was hidden behind some bushes, out of sight of the nest. Sitting in the middle of a wooded area with all the birdsong, rustling in the bushes from the animals and birds and the lack of people in the surrounding area was a bit scary. 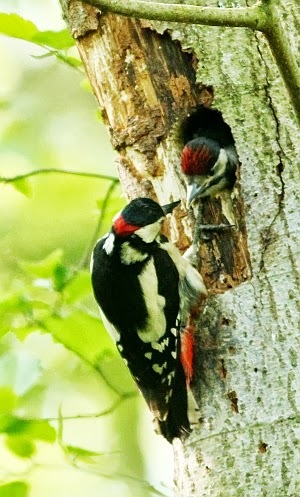 The young Woodpeckers were making a screeching noise which got louder as the parents arrived at the nest with food. 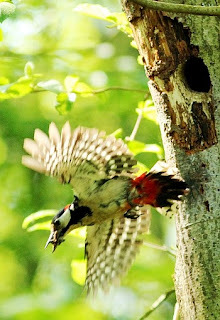 In the photograph above the male bird can be seen outside the nest feeding the juvenile bird. The male bird can be identified by the red patch on the back of its head, while the juvenile bird has a red patch on its head. 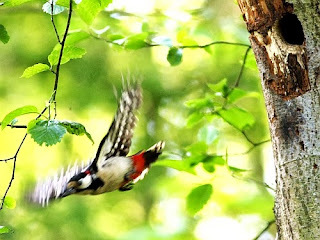 After feeding the juvenile, the adults flew off to collect more food. Both the male and female birds were busy feeding the juveniles. 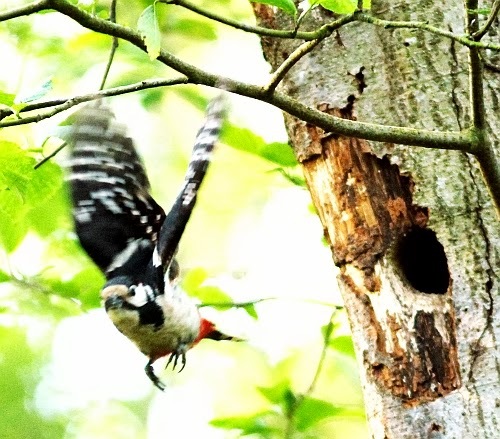 The food being taken to the nest included flies, berries and other insects. In the above photograph the red head of the juvenile bird can be clearly seen. The adults were kept very busy. While I was sitting watching the birds I could hear some splashing in the pond to my right. I looked over and saw the family of Mute swans out for an early morning swim. Danger - Mute Swans Approaching! A short time later I heard rustling in the trees in front of me and saw the Mute swan family appear on the path in front of me. They were going to have to pass near where I was sitting, so I left my camera gear and walked into the wood to let them pass. Mute swans can be very aggressive when looking after their young and can break a person's arm with their wing. 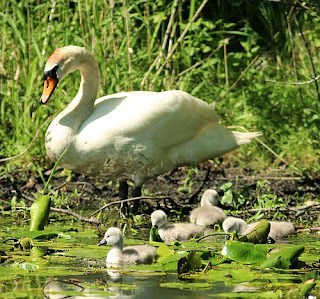 It's best to keep well out of their way until their cygnets are more mature. After they passed I resumed my position in front of the camera. Occasionally, the adult birds would enter the nest and clear out some debris left by the juveniles. 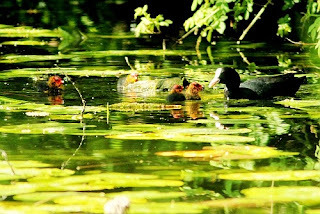 On another part of the pond two adult Coots were out on the pond with their young. 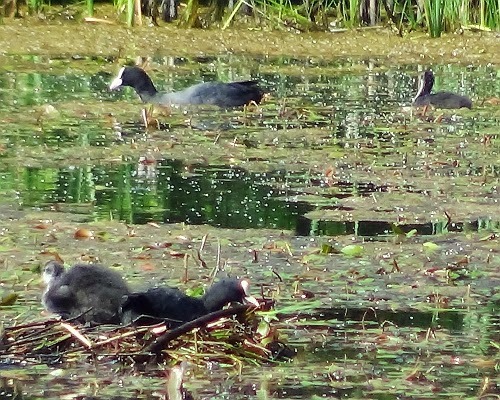 The chicks had only hatched recently in contrast to the Coots in the other pond whose young are far bigger. 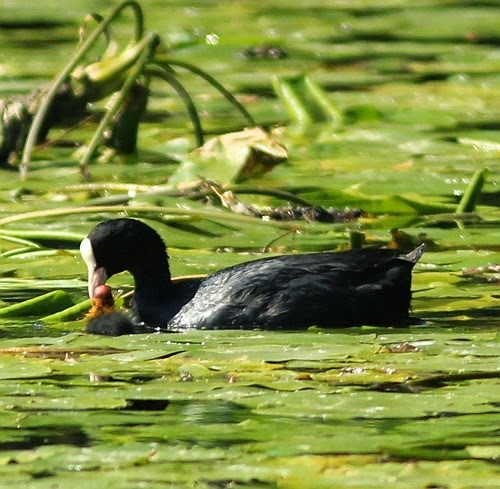 The pond is covered with water lillies but the birds can all manage to get through them quite easily. 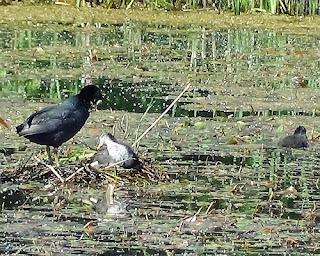 On the other pond the Coots were out and about and were much older than the ones on the other pond. 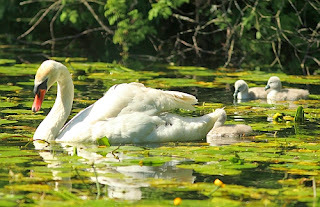 The Mute swan family were still out and about in the pond after my near encounter with them a few hours earlier. The Mute cygnets and the Coot chicks look cute and will grow at a fast rate before winter arrives and with it the cold weather. I will be keeping an eye on the progress of these families as their young develop throughout the summer and autumn.